﻿I studied art at Bishop Otter College Chichester 1971 – 1975. My main focus at that time was sculpture when I first encountered working in metals. 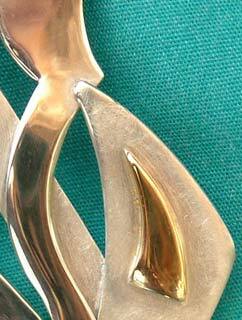 I began working in silver in 1976 but the needs of a young family took precedence. In 2001 I took up artwork again. I completed the City and Guilds -Jewellery Making and Design course at Northbrook College, Worthing studying under Clara Vichi and Lisa Hamilton and now work from my studio at home in Bognor Regis. I am registered with the London Assay Office. My work is entirely original. Individual pieces may develop a theme but are never identical. I sometimes work with found materials and semi precious stones, adding colour and texture to my pieces. I frequently combine silver with gold or gold leaf. My work is individually priced as each piece is unique. Prices range from £5 to £200 depending on materials and time taken. I hope you enjoy browsing my gallery. Click on the thumbnails for more information on the pieces and again on the main image to get a closer view.